"Born in the Wake of Freedom"
As the Virginia Newspaper Project staff sifted through the many issues of the Richmond Planet held in original paper format and in microfilm in the collections of the University of Virginia, the College of William and Mary, and the Library of Virginia, it became apparent that John Mitchell, Jr., was a man of enormous stature and complexity. Turning our attention to Mitchell's contributions to the social and political life of Virginia's African-American community dovetailed with real world events, both planned and unforeseen. Originally, the Project intended to create an exhibit that would acknowledge and celebrate Black History Month. However, the exhibit also inadvertently and indirectly became a memorial for the Richmond Afro-American and Richmond Planet, the successor to Mitchell's Richmond Planet, which ceased publication in February 1996. Despite the rise and fall of individual newspaper fortunes, the daily press continues to be a vital part of the world of mass communication, and within the pages of a Richmond Planet or Afro-American is contained a living document that chronicles the history, culture and social life of a community. We hope that the exhibit images provide a context to understand Mitchell's life and work better. The images and accompanying text will also provide viewers with a glimpse into the world of newspaper publishing as America entered the twentieth century. John Mitchell, Jr., and the Richmond Planet addressed and attacked the ugly realities of race relations both regionally and nationally. Images of the Ku Klux Klan and public lynchings, scathing political cartoons, chilling lists of those killed by unruly mobs, and politically charged essays were the stuff that made up the contents of this weekly paper. 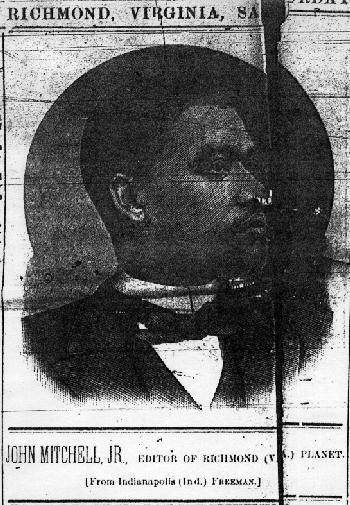 It is the Project's intention that the exhibit on John Mitchell, Jr., and the Richmond Planet will encourage people to use newspapers as a primary source in researching cultural, political or social history, and to reintroduce people to the potential of newspapers as sources for scholarship. A brief note about the original source materials. Working on this exhibit, the Newspaper Project was forced to revisit the inescapable preservation crisis that faces many of Americas newspapers. As Project staff and library patrons know all too well, the acidic properties of mass produced paper threatens the stability of collections throughout the state. Reviewing issues of the Richmond Planet dating from the late 19th to the early 20th centuries, Newspaper Project staff were struck by the deplorable condition of much of the original hard copy. In fact, in a number of cases, it was impossible to cull images from original hard copy due to the extremely deteriorated condition of the paper, and it is likely that there are no pristine paper files extant. It is hoped that exhibits such as this one will not only provide information on the subject, but will also call attention to the challenges related to newspaper preservation. One will notice that there is more to a newspaper than mere text on a page: images, layout and presentation will often serve a scholarly purpose. The choices made in creating headlines, lead stories, and political cartoons (not to mention the advertisements), all the features that make up a newspaper, serve as individual bits of evidence that tell the reader about the time in which the paper was produced. This Exhibit is based on an idea of Joy Weatherley Williams and was compiled for the WWW by the staff of the Virginia Newspaper Project, notably: Joy Weatherley Williams, Sol Joseph Bermann, and Clay-Edward Dixon.